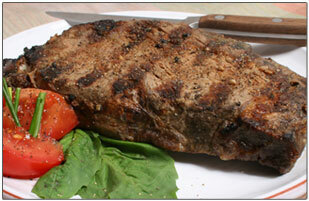 Dad will love this Grilled Ribeye with Chili Powder Rub. Spice up the taste of a tender grilled ribeye beef steak with this lively blend of seasonings that provides this grilled steak recipe with a distinctive Southwestern flavor. Surprise the dad at your house with homemade ice cream. Learn how to make this summer time treat at home and browse the different recipes that you can have fun experimenting with. We have step-by-step instructions. Slow grilling a chicken that self marinates as it cooks results in a tender and juicy, easy to prepare meal. Turn bell peppers into containers for your burger and hot dog condiments at your next barbecue or cookout.